About all they do... Loricaria profile. any of that yet - I'm paranoid about washing away my good bacteria!). ammonia-.1 and ph->8). I had a pack of 5 of those strip tests and was only using them to gauge the hardness after verifying it matched the other parameters measured by drops, or was close. The numbers on the hardness have not changed in the 6 weeks since I started the tank. is good to hold pH steady, and that seems to be the case. I have 2 BN Plecos doing pretty good (except for behavior question below) in the tank. I have 8 Harlequin rasboras in QT, and 5 Nerite snails and 5 cherry shrimp on the way. Do I need to ratchet up that GH? Epsom salts? What won't raise the pH? <Depending on what you might add to raise GH it might raise the pH or not. his place on the rock. I don't think "Thing 2" is doing this (the other Pleco), and it is happening sporadically - if I stand and watch, he may do it once, but I've seen him do it about 5 times altogether, over the past 3-4 days. I've given them a couple Pleco wafers every other day or 2, except the day I gave them a zucchini. What's up (literally) with the Pleco? I've had them for about a week now. going on if you know???? <Most likely territorial interactions if they're different species. That's the funny thing, they appear to really be enjoying each other. It looks like play and dancing. I haven't seen any aggression. At times they look like synchronized swimmers side-by-side doing almost the same movements. It's really a trip. They also like to bathe the large Oscar which he allows. <If by this you mean sucking on the Oscar's flanks, this isn't good at all! Oh and I do believe that they are Plecs I bought them years ago when they were quite small. They are both spotted but one is a lot darker than the other but they match in size. They really are a couple of characters. <Cool. There are a few Pterygoplichthys species widely traded as "Common Plecs". Pterygoplichthys pardalis is light grey with dark grey squiggles. Pterygoplichthys multiradiatus is more light brownish with dark blotches and spots. Pterygoplichthys gibbiceps is beautiful wood brown with dark brown spots, very giraffe-like. Hypostomus plecostomus is similar but seems to be quite rare. Nonetheless, you can easily tell Hypostomus from Pterygoplichthys; whereas Hypostomus has 7-8 rays after the dorsal fin spine, Pterygoplichthys have 9-14 such rays after their dorsal fin spine. 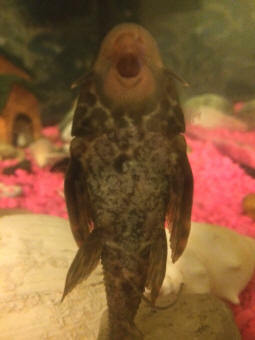 I have one female Bristlenose Pleco in a 75 gallon along with 7 emperor tetras, 6 Congo tetras and two angelfish. The Pleco has always kept the glass on the tank clean and has been fed algae wafers every second day and has real wood that it attaches itself to. The Pleco has been in the tank for about six months. Recently the Pleco has just stopped cleaning the glass. Is this common or a sign that something is wrong? Thank you. <Mmm, well... your tank may be getting more "nutrient laden" with time; fueling more algae than one Ancistrus can handle... See WWM re control, maintenance... Or the type/s, species of algae may be changing to something unpalatable... Or the fish may just be satisfied w/ other sources of foods. time....hence why I am asking you for help. First of all, thanks for the help with my convicts; they are doing fine, and the eggs are noticeably brown now. I am hoping for fry by tomorrow! Anyways, I have a couple new questions. First, my pl*co: He's becoming very skittish now. There was a time when he was very aggressive, latching onto one of my gouramis, but not the other; ever since the picked on Gourami died (of unrelated causes; the pl*co left him along for the last few months of his life) the pl*co has been peaceful. He even made progress towards being more of a day fish; for the last few weeks, he was more active during the day. But now he's regressing, becoming skittish whenever I go to check on him. An worse: He's developing a few bite marks on his dorsal fin and tail. On a happier note, how should I get the food to my Convict fry when they hatch? I've read to take a plastic bag with a small hole, fill it with ground-up fish food, and squeeze some out when near the fry. Is this right? And won't the parents be annoyed?